Did you know that in the 1800s the eccentric American entrepreneur Frederic Tudor got the idea to harvest lake and pond ice from New England and sell it in hot places like Cuba, Martinique, India, and the American South. From there, it wasn’t long until ice ended up in cocktails. 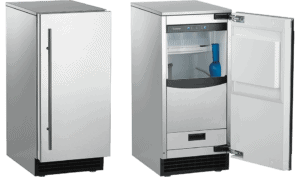 If the hot Dallas summer months have you fantasizing about cold, icy drinks … a lot of people have purchased high-end ice makers like those sold by Scotsman Ice, which C&W repairs. The first perk is the sheer girth of the ice cube product. Gourmet cubers produce up to 30 pounds of ice in 24 hours. The difference between a regular bag of ice and the gourmet ice cubes are that gourmet models have been researched and tested over time to produce distinctive shapes which resist clumping and melting. This, in turn, preserves the genuine flavors of your cocktails and party beverages. No more watered down drinks to throw out! Gourmet cubes are solid, clear, and odorless, which will give your party cubes a clear edge in the flavor of your beverages. Some models produce the ice nuggets for a textured, soft ice great in blended drinks, smoothies, and food displays. Imagine surprising your guests with gourmet cocktails and beverages unspoiled by dilution or bizarre ice flavors. Your drinks will be the talk of the town! And remember if your Scotsman ice machine is not working just right, C&W Appliance is just a call away to fix it.